In a bowl, whisk together the butter, coriander, garlic, shallots, yogurt, lemon zest, lemon juice, salt and pepper, and set this aside. 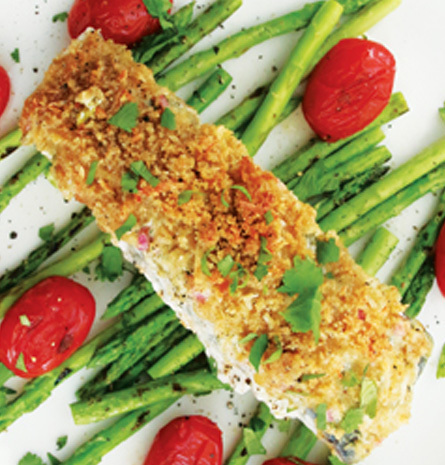 Mix together breadcrumbs and olive oil until the breadcrumbs are moist. Add Parmesan and some black pepper. Mix to combine. Season fish on both sides with salt and black pepper. Place fish on a lined and lightly greased baking tray, skin side up. Spoon the butter mixture over the fish. Spoon the breadcrumb mixture over this and press down gently. Place the fish in the oven. Bake 20-25 minutes. Transfer fish onto a serving plate. In a pan, add a little olive oil. Lightly toss asparagus for 2 minutes or until slightly charred. Remove from pan. Lightly roast cherry tomatoes on the pan until lightly charred. Remove from pan. 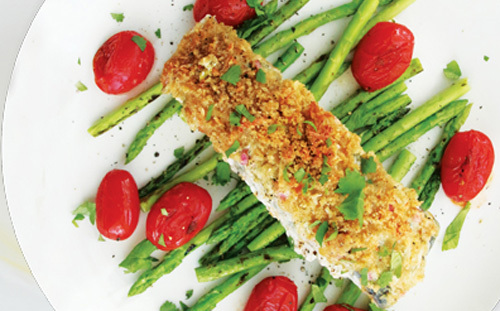 Serve fish immediately with asparagus and cherry tomatoes.